Scrutiny Grows For India's Spiritual Leaders, And Their Wealth : The Two-Way India's gurus are often compared to America's televangelists, as they adopt electronic media to widen their base of followers and build a powerful organization. For instance, Yoga guru Baba Ramdev's TV broadcasts reportedly draw audiences of some 30 million. 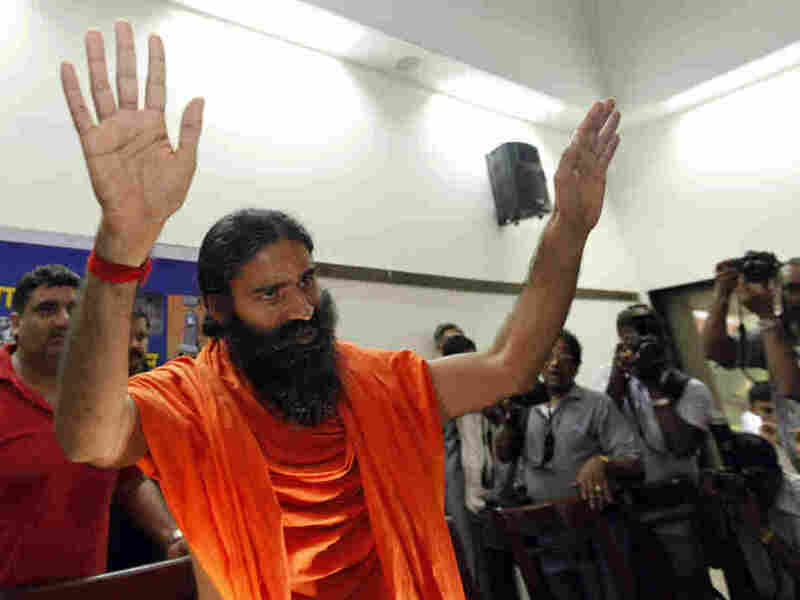 Guru Baba Ramdev's anti-corruption protests helped draw the attention of the government, which then began looking into his financial holdings. Here, he arrives at a media conference in New Delhi, June 26, 2011. The discovery that the vaults of a Hindu temple held a treasure worth $22 billion shocked many in India and beyond — especially because the vaults were last opened some 150 years ago. Now the Washington Post is reporting on the ability of India's "godmen" to accumulate money from millions of followers. Taken together, the stories outline deep historical ties between religion and wealth in India. And they prompt questions about the funds amassed by charismatic spiritual leaders. India's gurus are often compared to America's televangelists, as they adopt electronic media to widen their base of followers and build a powerful organization. For instance, Yoga guru Baba Ramdev's TV broadcasts reportedly draw audiences of some 30 million. But Ramdev ran into trouble earlier this summer, when he went on a fast as part of a protest against government corruption. Police raided a demonstration by his followers, many of whom were injured as they were expelled from a New Dehli park. Evidently, that political act put Ramdev in a different sphere, in officials' eyes. Soon after, he was forced to declare his assets, with the government sniffing around for signs of tax evasion or money laundering. His trust alone was found to be worth $250 million, a figure that likely includes his yoga university but probably not his Scottish island — renamed Peace Island — or global business interests that include a pharmaceutical company producing ayurvedic medicine and herbal products. "The numbers are staggering, but the ideas that fabulous wealth resides in these places is not a surprise," said social commentator and columnist Santosh Desai, who says that followers often take pride in the wealth of their chosen gurus. "It is curious in a way, for something ostensibly about a distance from things material, and closeness to things spiritual; the two sit side-by-side very comfortably." And when guru Sathya Sai Baba died in April, his holdings were valued at more than $9 billion, with some estimates ranging as high as $12 billion. As for how the followers of Sai Baba reacted to news of his stockpiled riches, the Post story says that "few of his devotees, who include some of India's leading politicians and industrialists, as well as Goldie Hawn and Hard Rock Cafe founder Isaac Tigrett, seem to care. India's most famous cricketer, Sachin Tendulkar, wept openly at Sai Baba's funeral." In fact, Tigrett now seems to be vying to control part of Sai Baba's fortune. By the way, he earlier borrowed the guru's motto for his Hard Rock chain: "love all, serve all." For some, the riches amassed by Sai Baba have brought doubts that he did enough charity work. His holdings included millions of dollars in cash, kept in his private quarters. But Swaminathan Gurumurthy disputes those doubts in a recent opinion piece, in which he defends both the gurus and the economic system that supports them. In Gurumurthy's view, the gurus take on infrastructure and local projects that the central government seems to ignore — he lists schools, irrigation and hospitals as some of the lasting signs of Sai Baba's work. Belgian Michiel Vanaerschot, 24, agrees, telling the Post that the buildings and worship centers that Baba ordered built will serve as monuments to the spiritual leader. "People who don't believe, they just can't handle it," he said.